"How many evictions take place in Chicago every year?" is a simple question without an easy answer. When the Reader began reporting on evictions in December, we found that the last comprehensive study of Cook County eviction court was conducted in 2003 and that data about eviction court proceedings isn't systematically reported by any county agency. Furthermore, in contrast to foreclosure-related information, there's a dearth of information about eviction trends in the county over time. But through a data request to the Clerk of the Circuit Court of Cook County, the Reader has now obtained information about eviction case filings dating back to 2006. The data reveals that eviction filings in Chicago are trending downward, falling by nearly 30 percent from 33,042 in 2012 to 23,616 last year. Meanwhile, filings have slowly climbed in the suburbs, increasing by 20 percent from 7,817 in 2013 to 9,359 last year. The biggest growth in filings has been in the south suburbs, where they've increased by 56 percent in that period. Though not all filings result in evictions, they're a marker of tenants in distress—a landlord can't legally evict a tenant without going through the courts. One of the main complications with quantifying evictions is that in a major city with a large renter population evictions don't always happen formally. 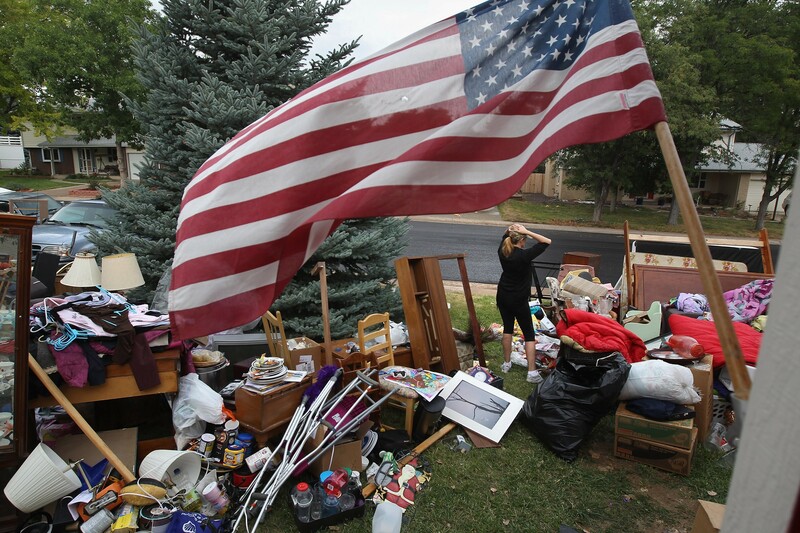 Renters may experience what researchers call "forced moves" or "informal evictions" whereby landlords significantly increase rents, stop maintaining properties, or apply other pressure tactics. Currently there's no data on the prevalence of such forced moves in Chicago, but a recent study of the renter population in Milwaukee found that half of the evictions in that city were informal. As for formal evictions, these are somewhat easier to track, because they happen through the courts. Every year the Circuit Court of Cook County receives between 20,000 and 30,000 eviction filings—a few thousand from banks who want to evict foreclosed-on home owners, but mostly from landlords who want to evict tenants. If the landlord wins the case—which is the most common outcome—the judge issues an order granting the landlord possession of the unit and sets a date by which the tenants have to leave. After that, the vast majority of evicted tenants leave on their own. Sometimes, the landlord and tenant may resolve their dispute even after the landlord is granted possession of the unit so that the tenant ends up staying. In rare cases, when the tenants don't leave on their own, the Cook County Sheriff's Office conducts an eviction and physically removes the tenants from the unit. Mark Swartz, director of the Lawyers' Committee for Better Housing, which provides free legal aid to tenants facing eviction, has kept his own ledger of eviction filing numbers since 2000, and has also noted a decline in Chicago filings in recent years. But he cautions against framing the drop as an improvement. "Eviction [filing] numbers going down does not necessarily mean that Chicago renters are faring better," Swartz wrote in an e-mail. "Those of us who practice in eviction court defending renters do not see evidence of that." 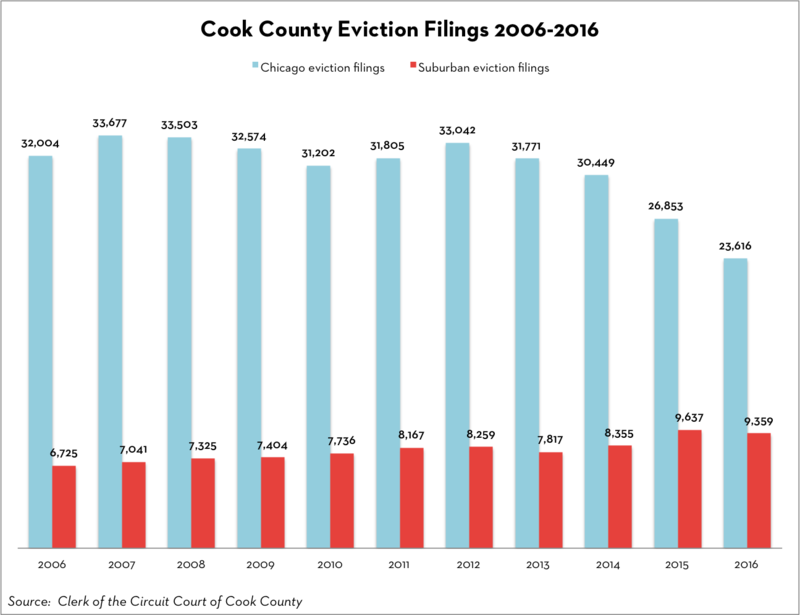 He and other attorneys who practice in Cook County eviction courts have some theories about what might be behind these apparent trends. First, it's possible that the proportion of low-income renters more vulnerable to eviction in the city has fallen even as the overall renter population has increased. According to the DePaul Institute for Housing Studies, the renter population in the county has steadily grown since 2007. However, nearly 30 percent of renters—the largest subset—have remained extremely low-income households making less than $18,500 per year. Plus, a growing number of low-income renters in Cook County are also rent burdened—meaning they spend more than 30 percent of their income on rent—and are thus more likely to struggle paying month to month. But this would all suggest that eviction filings would rise, not fall—the opposite of what the data suggests. Another theory is that rental housing stock for lower-income households has shrunk, leading to fewer options for people in need. Indeed, according to DePaul's IHS, the greatest shortage of available and affordable rental housing is in areas of the city with the highest concentration of poor households. Swartz thinks there may be "fewer low-income residents left in Chicago to evict," and that the falling eviction filings confirm what he says he sees in court every day: "Low-income, cost-burdened renters are being priced out of the region." Since 2000, the poorest areas of the city, on the south and west sides, have lost roughly 250,000 residents, according to U.S. Census Bureau data recently analyzed by Crain's. Meanwhile, in the suburbs, where the low-income population doubled between 1990 and 2010 and the percentage of renter-occupied housing units has also grown, eviction filings have, perhaps predictably, crept up. The largest growth of suburban renter-occupied housing units has been in Chicago's south suburbs, where eviction filings have also grown the most of any suburban area. 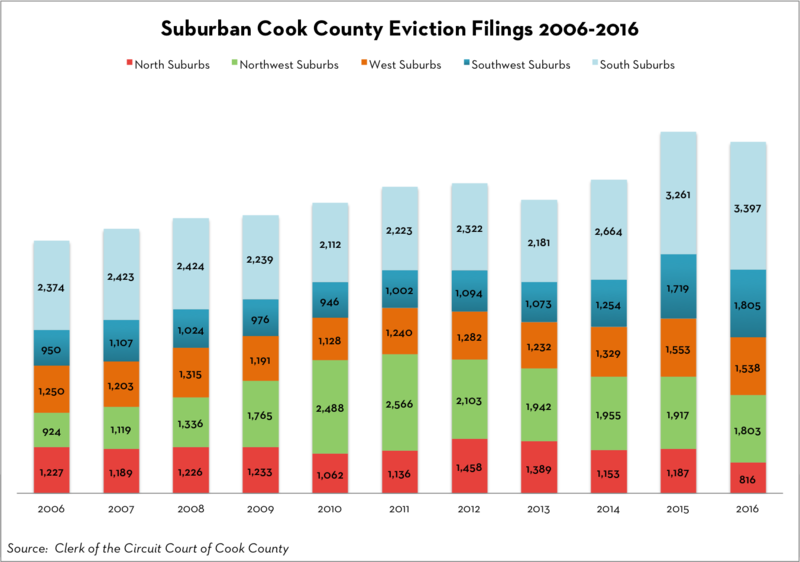 The circuit court's Markham-based Sixth Municipal District, where evictions for the south suburbs are filed, is described by attorneys as the second-busiest eviction court in the county, after Chicago. "Evictions here are five days a week," says Tim Hufman, an attorney with the Legal Assistance Foundation who mans a help desk for tenants facing eviction proceedings in the Markham courthouse. Most of the cases he sees are brought for nonpayment of rent. Hufman says that the tenants he meets are mostly very low-income people without savings to get them through sudden financial difficulties like medical emergencies or car troubles. "When you see them come in it's not because 'I'm not gonna pay my rent to go to Hawaii,'" he says. "People who are poor don't have any reserves. If there's anything that happens out of the ordinary, huge unexpected expenses, the rent doesn't get paid." Eviction filings are one marker of renter households in distress, but the next question is what happens to those filings throughout the court process. Data previously reported by WBEZ suggests that actual evictions have been on the rise since 2010. Could it be that, despite fewer filings, tenants are losing cases more frequently? "It is more difficult than ever for renters to obtain good outcomes in eviction court and for advocates to stabilize their clients' housing," Swartz says. Next week, we'll look into this question, exploring data on Cook County eviction court outcomes for tenants and landlords. Report finds 40 percent of Cook County eviction filings don't end in a judgment against the tenant, yet can still lead to difficulty finding new housing. A new grassroots coalition is mobilizing in the face of rising rents and no-cause evictions. While having a lawyer improved prospects for tenants, data suggests landlords do better without them. Court data shows that landlords won more than 60 percent of eviction cases over the past two years. The prevalence of verbal landlord-tenant agreements leaves low-income immigrant households vulnerable.